Special Seating requires expert assessment of the clinical, functional and practical needs of each individual client and carers. 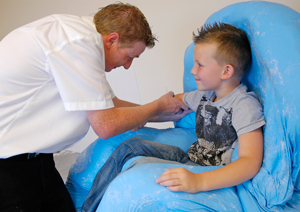 At Specialised Orthotic Services Ltd (SOS) we have over 30 years experience in providing Clinical Services for the Assessment, Manufacture and Supply of Special Seating Systems. This has enabled us to assist many Wheelchair Service Centres throughout the country with their Special Seating Service. SOS is the original Special Seating company and is renowned for it’s quick efficient approach to delivering effective Special Seating solutions and have formed long standing working relationships with numerous wheelchair services over many years. At SOS we firmly believe that a successful Special Seating Service depends on a close working partnership with all our colleagues at Wheelchair Service Centres. Our Clinical Service is based on a 4 week cycle from assessment to supply which gives Wheelchair Services the option to provide speedier more proactive clinical service for Special Seating clients. Wheelchair Service Centres working with SOS are allocated regular clinic sessions along with a designated Clinic Specialist providing continuity of service and allowing effective forward planning for Special Seating commitments. Clinic dates are set well in advance, allowing a timetable to be adopted benefiting both the Wheelchair Service and clients attending Special Seating Clinics. SOS has an excellent reputation for dealing with extremely complex seating problems and can offer a comprehensive range in the types of Special Seating available. If you would like to discuss with SOS your own Special Seating Services we would love to hear from you. Please contact us to see how we may assist you in this specialised clinical area with our comprehensive range of products and services and unrivaled expertise.